Scientists who travel to foreign countries where political tensions run high become a sort of double agent. In addition to completing their science mission and objectives, they work to find threads of shared humanity, dispel stereotypes, and grow our global community. In some cases, our traveling U.S. scientists may be the first American that a foreign scientist gets to know. Representing the U.S., professionals have the opportunity to build a more accurate image of Americans, show kindness and interest, and reach beyond political barriers. 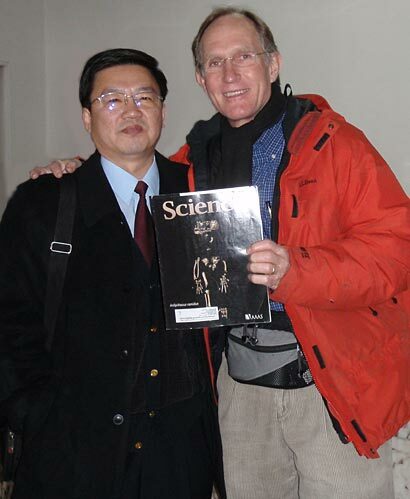 "I'd like to think that science brings countries closer together," says Peter Agre, former head of AAAS and Nobel Prize winner who's currently a professor of biological chemistry at Johns Hopkins University and director of the Johns Hopkins Malaria Research Institute. "While we're there as Americans who are scientists, we're viewed as colleagues and scientific brethren," says Agre, who has visited North Korea, Cuba, and Iran, among other countries, in the last few years. "It's not without challenges ... but the experiences that I've had have been invariably positive, respectful, and optimistic." On his trips to North Korea, Agre remembers a few times when the visit bordered on intimidating. The North Koreans could be stern, observed Agre, whose group — the U.S.-Democratic People's Republic of Korea Science Engagement Consortium — met with State Department officials as well as members of the senate foreign relations committee to prepare before embarking on the first trip of its kind to North Korea, to facilitate and promote scientific exchange and collaboration. But there were even more occasions to have hope. Agre recounts a story of breaking down boundaries: During Agre's 2009 North Korea visit, the general director of the Korea Science Corporation in North Korea mentioned that his 8-year-old grandson was afraid of his grandfather spending time with Americans in a hotel, and had told his grandfather to bring a rifle. Seeing an opportunity to improve relations in a small way, Agre took out some granola bars he had brought and gave them to the director to pass on to the grandson. Then, at the 2011 follow-up meeting in Atlanta, he got to see how his actions made an impact. As members of the American consortium sat on one side of table, and North Korean on the other side, "The meeting started out formally," Agre remembers. The North Korean director — stern as ever — recounted that revenues for the collaboration had not been received. "Thinking of a way to break the ice, I asked, 'how is your grandson? Did he mention 'bring the rifle?'" Agre remembers. "He broke into a big grin, [and said] 'no, bring back some granola bars!'" Connecting on an individual level is important for scientists working to build relations — something that must be done in person, not over the phone or through email. Charlie Dunlap, a geochemist and associate program director at CRDF Global (a nonprofit that promotes international scientific collaboration), has traveled to a dozen countries in the name of science. During a trip to Indonesia, where he led professional skills development workshops for professionals and students in collaboration with the Indonesia Chemistry Association, he says, "It wasn't just a matter of the basic guidance and examples we were giving on writing a grant proposal or publishing a peer reviewed paper — one could read that on the Web, for example — but what really made the interaction effective and built bridges was the shared understanding of the challenges we all face in scientific research," says Dunlap, who had informal discussions with the Indonesian scientists during coffee breaks in the training. "You could understand the value of the contact beyond the specific objective material being discussed." Challenges such as applying for grants and publishing research are present for scientists everywhere. Knowing that other scientists around the world are working through difficulties, too, can be yet another square foot of common ground. Says Dunlap, "For the scientists in Indonesia to feel and see that the Americans, who they respect as being a successful science community, are actually having the same challenges and struggles ... is encouraging." "I believe that science, art, and culture can bring people together," says cultural heritage specialist Sorna Khakzad, an Iranian-born Ph.D. candidate at KU Leuven (Belgium) who is researching landscape issues associated with underwater cultural heritage management. Her recent research took place in one of the ancient ports, Siraf, along the Iranian shore of the Persian Gulf. Khakzad's says it was exciting to work with her team of four U.S. scientists from East Carolina University, the Institute of Nautical Archaeology, and the Viking Ship Museum in Denmark — on a series of underwater excavations to identify the ruins of the port. The project required diving and swimming in an Islamic country. She gathered this all-volunteer team, who joined her out of interest and willingness, to help her with the surveys and explorations; due to sanctions, most of her applications for funds were rejected, and she found the Iranian government had no money to invest in such a project. The water proved to be refreshing as temperatures regularly soared above 110 degrees Fahrenheit and humidity rose to a steamy 90 percent. Through those extreme conditions, her team managed to complete tasks without offending the rules and code of Islamic dressing, Khakzad reports. "For land survey, it was not so difficult to keep up with the codes," she says, but for the underwater exploration, employed a couple strategies: one was to keep a low profile on project activities so as to avoid drawing a crowd. Another strategy to avoid religious protest was for Khakzad to dive with a female partner rather than a male. Most of the U.S. team members had never been to Iran before, and their perception of Iran was limited to what they received from media, friends, and other sources. "My American colleagues were surprised by the Iranian hospitality and Iranians were happy to see that in this moment of hard-talks, Americans came to Iran for cultural activities, " says Khakzad, who has worked on international projects in Iran, Turkey, Afghanistan, Pakistan, England, and Italy. "The stories each individual takes home will, little by little, create an image of the people who live their daily life, the same as everywhere else in the world, with their dreams and wishes for a better life, free from the influence of any political agenda." Cultural differences don't often get in the way of scientific collaborations and working together, says Dunlap of his foreign travels, and there aren't as many cultural differences to be careful of as one might imagine. "Frankly, the scientists are usually knowledgeable enough about the world that they're not going to be hypersensitive to small things — people enjoy the cultural differences in our context," he says. Sometimes, however, these international gatherings come with unique challenges that stem from political circumstances. Upon meeting the North Koreans, Agre and his team got business cards, but the cards all had the same email address, making it difficult to communicate directly or quickly. But although visiting countries such as North Korea or Cuba can be intimidating, Agre says he never felt unsafe. When people ask if he's felt safe in these countries, Agre typically shoots back "Well, I'm from Baltimore — have you seen 'The Wire?'" "It gives me some degree of personal sense of accomplishment that we have made colleagues in these countries where our governments have no good things to say about each other," says Agre, who credits the organization of many of his trips to Vaughan Turekian, who heads the AAAS Center for Science and Diplomacy, as well as in cooperation with other science and non-governmental groups, such as CRDF Global. These international collaborations have the potential to lay foundations for good relations as well as clear misunderstandings between nations when there is political tension, explains Khakzad. She says her time as director of the joint U.S.-Iranian archaeological project showed her that where political tensions exist between Iran and the U.S., cooperation between Iranians and American scientists demonstrates that "people can get along easily and can help each other improve when they set aside the problems unrelated to science and culture." "During our project I saw how we can work together, how we can discuss issues and come up with new ideas," Khazkad says. Agre believes that there will be a time when governments change and American scientists will know the scientists from totalitarian countries both as professional colleagues and as friends. "They're real people," Agre says. "It's easy to overlook the human side but maybe in end, that's the most important benefit of this." AAAS: In a Stormy Arab Spring, What is the Role for Science Diplomacy?